The kings of Saharan desert blues, and heroes of the Touareg struggle for freedom, dignity and self-determination. After nine albums and over 1400 concerts throughout the world, the band return for a unique live concert in one of the most stunning venues in the country – Manchester Cathedral. 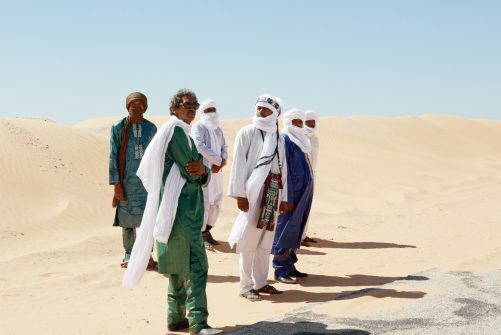 During the last 18 years Tinariwen have become globally loved and revered for their creation of a new music genre as well as the integrity and tenacity with which they defend their culture. Hugely attractive to both audiences and musicians who find in it some kind of truth and spiritual depth. The soundtrack of the Touareg revolution in the 1990s was made by electric guitars. Rhythms inspired by the gait of the camels, somewhere between the Malian blues and the melismas of the Maghreb. Blues from the desert whose lyrics rage against indifference and express nostalgia for disappearing freedoms and their lifestyle that has existed for thousands of years. The Tinariwen sound is primarily guitar-driven in the style known as assouf among the Tuareg people. The Tinariwen guitar style has its roots in West African music, specifically that from the “great bend” region along the Niger River, between Timbuktu and Gao. The core elements of Tinariwen’s music are traditional Tuareg melodies and rhythms. In the late 1970s, when the founding members of Tinariwen started playing acoustic guitars, they played a traditional repertoire adapted to the western guitar. While the Tinariwen style is vaguely a distant relative of blues music, via West African music, the musicians themselves claim to have never heard American blues music until they began to travel internationally in 2001. “They were proper rebels, and what a wonderful way to advertise a problem to the world: through music. You don’t have to understand the words to hear something deeper in it. It’s the mood that says it all.” (Q Magazine, UK). “…a mesmeric evocation of the mood of yearning inculcated through years of exile, all nourished by the vast emptiness of the desert” – The Independent.